This blog provides an introduction to the basic principles of temperature measurement and an overview of common instruments for measuring temperature in industrial applications today. Accurate temperature measurement is a requirement for almost all modern industrial processes. One or two degrees can make a huge difference in some refining and manufacturing processes, possibly even leading to the loss of raw materials or product. That’s why plant managers and process engineers demand accurate temperature measurement products that supply repeatable results. They count on robust, reliable bimetal thermometers; gas- or liquid-filled thermometers; resistance thermometers, also called RTDs (resistance temperature detectors); and thermocouples to provide precise, near-real-time temperature readings for optimum control of their processes. A temperature transmitter, which includes a sensor, is usually installed in a connection head at the measuring point, but can be located nearby in a control cabinet. WIKA offers dozens of specialized instruments for electrical temperature measurement, including thermocouples, RTDs, temperature switches, and temperature transmitters. The temperature sensor is the functional internal element of an electrical temperature measurement instrument. 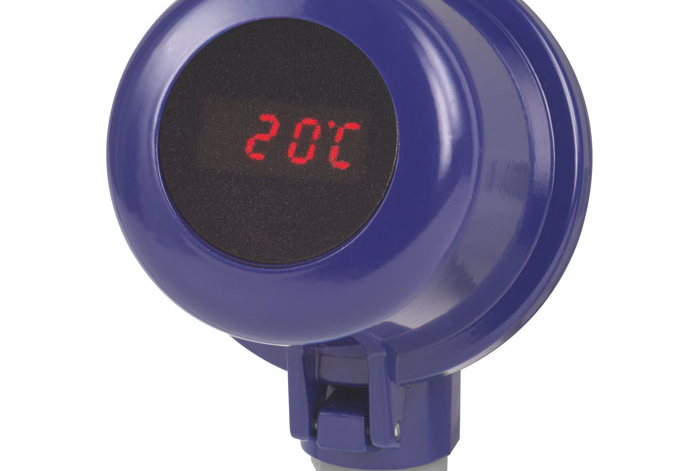 A temperature sensor converts a temperature reading into an electrical signal sent directly to a display or to a remote control location by a transmitter. A resistance thermometer operates on the principle that the electrical resistance in a metal wire changes based on the temperature. WIKA resistance thermometers, such as the TR10, TR15, and TR21, TR22, TR53, and TR25 (for sanitary use) typically include the Pt100 or Pt1000 platinum-based sensor. A thermocouple measures temperature using two metal wires, each with a different electronegativity. The two wires are welded together at one end; this is the measuring point (hot junction). The wires on the other end, called the cold junction, connect to a reference junction block, whose temperature is measured separately. A voltage (potential difference) then forms based on the temperature difference between the two junctions. The thermocouple measures the temperature of the hot junction by reference to the known temperature of the cold junction. WIKA offers several thermocouples, including models TC10, TC40, TC59, and TC96R (a multipoint thermocouple). A temperature switch, such as the TSD-30, is designed for process control, and can produce analog output signals. Mechanical temperature measurement instruments include bimetal, gas-actuated, and expansion thermometers. A bimetal thermometer comprises two bonded metal strips with different expansion coefficients. The bending of the metal strips that results as the temperature changes can be measured, and calculations applied to determine the current temperature. WIKA bimetal thermometers include models 30, 46, and TI.54. A gas-actuated thermometer typically contains an inert gas or a gas mixture. The gas pressure changes based on the temperature, and the relative change in gas pressure is converted to a temperature reading. WIKA gas-actuated thermometers include models 73, TGT73, and 74 (for sanitary applications). The expansion thermometer is a system that measures changes in pressure in a liquid-filled chamber as the temperature fluctuates. The change in pressure is then converted into a temperature reading and displayed. WIKA offers models 70 and IFC expansion thermometers. Industrial applications require reliable, accurate temperature measurements. To meet those needs, WIKA carries a comprehensive line of high-quality mechanical and electrical temperature measurement instruments.